To convert a value from octal to decimal (base 8 to base 10), we first need to know what an octal number is. The octal system is a numerical system used in digital electronics. In this system of numbers, the symbols are counted only from ‘0’ to ‘7’. In base 8 we only have eight different symbols (there are no symbols such as '8' or '9'). Similarly, the decimal system (base 10) has ten symbols, '0' to '9' and the binary system (base 2) has only two symbols, '0' and '1'. 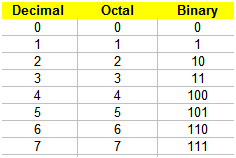 The following table shows the meaning of all the symbols in the octal system and the equivalents in the decimal and binary systems. You can see that from 0 to 7 a number in octal is exactly the same as it is in decimal, but what if you need to go beyond 7? Here's a video that explains you the concepts behind the numerical equivalencies in different systems. After the video, we show you how to code that in Matlab. The parameter base can be anything, not only 8.
base2dec('1352', 8) produces a 746. It’s important to remember that octal numbers are treated as strings. This is the idea that is shown on the video. If you run the code above, you'll get this result on screen (edited for clarity).